Let’s head south for one heck of a situation down at Avianca. The airline is currently entertaining bids from Delta, United, and Copa, and the backroom drama is high. This one is a fascinating read. Here’s another tale of an airport that overspent on terminals (A LOT) and has found itself scrambling to figure out how to attract more service. It’s working on restructuring lease deals, but it still has a crushing debt load. It’s a twofer for the NYT this week, but this story just makes you want to pay any price to stay at the new hotel being planned for the old TWA terminal building. 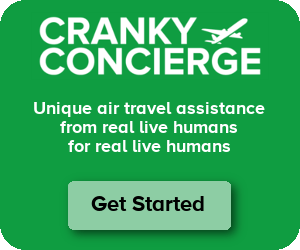 Crankyfest 2018, anyone? Any bets re: the Avianca situation, Cranky? Itami – I don’t know the situation well enough to be able to make an informed bet. But I do find it hard to bet against Delta (unless the government is involved). What is it about CA (and NY) and over-budget, over-priced, late terminals. Here in my home airport of RDU, we built a brand-spanking-new (gorgeous) terminal a few years back and gutted and renovated a second terminal, and still managed to keep CPE down at $6.35. I’m in for a Crankyfest in NY! I’m in – no need to fly, transit is all I need to get there. Woo hoo! Love watching the AV situation from fairly close up. The whole 3-headed LACSA/TACA/AVIANCA monster pits some powerful Central American families one against the other. As the Air Service Development Marketing Manager at SMF, I can assure you that there is no “scrambling” involved in the efforts to attract new air service. During the past 18 months I have held this position, a methodical, deliberate effort has been undertaken with new and incumbent carriers on specific key target nonstop routes.Traffic is up a healthy 5.2% YTD (Oct 2016) yoy, and we’re on-target to surpass the 10 million passenger mark for the first time since 2008. The overspending predates my tenure, but the current senior management team is acutely focused on continuing to reduce our cost structure to be more competitive, and airlines are responding by adding new service. New nonstop routes introduced during the past two years include: DAL (WN), MEX (AM), BOI (WN), ORD (AA), and BWI (WN). Upcoming new routes in the next six months include: SLC (WN) and SAN (AS). Mark – Thanks for chiming in. Any efforts to reduce operating costs for the airlines are bound to result in new service. It’s just unfortunate that previous management made such a poor decision on the overly expensive terminal project. Kudos to you for taking a bad situation and making it work as best you can. Alexa – A new terminal wasn’t a bad idea. It’s the scale and cost of the new terminal. Airlines are now starting to come into the airport, but the big jump in costs delayed that growth for years. It was certainly a setback to Sacramento when it opted not to do something more fiscally responsible.